"Your methodology as described in the book is sound, well reasoned and well communicated...it works as you described. I like the website very much." - from David S., CDx3 Notification Service subscriber, January 21, 2015. See more preferred stock investor reviews here. 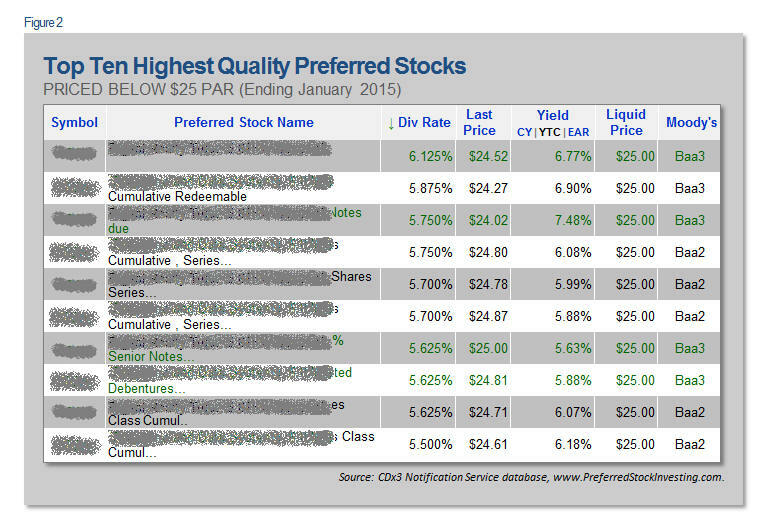 The ten highest quality preferred stocks that are selling for a sub-$25 market price are offering income investors an average 6.3 percent Yield-To-Call in today's preferred stock marketplace. As rates and prices move up and down over time, prices tend to move in the opposite direction, moving down and up, respectively. This is why preferred stock investing is long-term investing, taking advantage of the known inverse relationship between rates and prices over time. 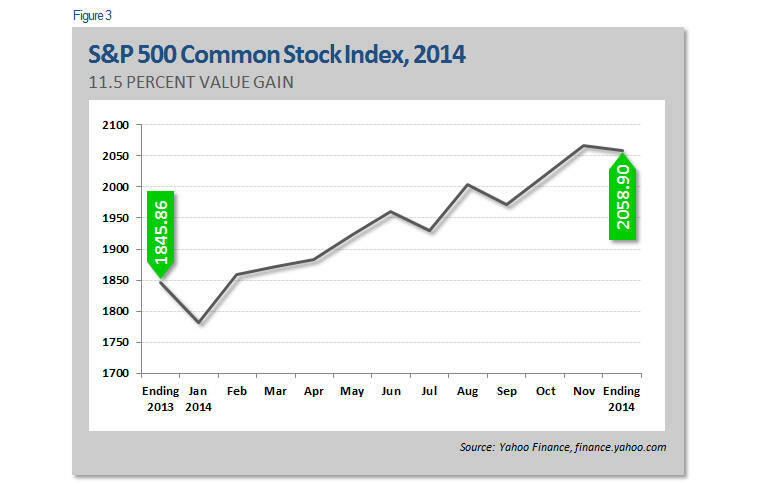 The common stock market, as reflected by the S&P 500 Index, had a great year last year. The S&P 500 started the year at 1845.86 on January 2 and closed on December 31 at 2058.90, a gain of 11.5 percent. One of the primary drivers for last year’s performance was the failure of the Fed’s withdrawal from its Quantitative Easing bond buying program to produce an increase in interest rates. Since the QE program was successful in lowering rates, the common wisdom at the time was that withdrawing from the program would surely produce the opposite result and rates would go back up. In January 2014, the Fed began its much anticipated taper, slowly backing out of the QE program, but to no avail; the widely expected rate increase did not materialize. The cheap money that U.S. companies had come to love would continue and common stock prices surged upward accordingly. On top of the 11.5 percent value appreciation, 421 of the 500 companies in the S&P 500 Index also paid dividends with an average current yield of 1.9 percent last year. By adding the two together (which relies on a bit of imprecise math), those investing in common stocks last year earned a total return of about 13.4 percent. 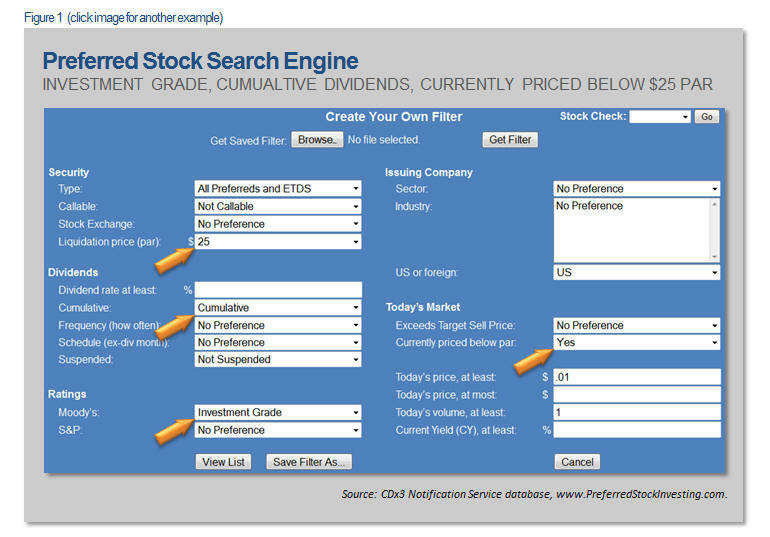 Preferred stock investors are generally investing for the steady income that these securities provide. With a long-term dividend average of about 7 percent, daily price fluctuations are not the primary focus. But that’s not to say that value appreciation opportunities do not present themselves. Importantly, the market pressures that act upon common stock prices can often be very different than those affecting the market prices of preferred stocks, so you do not want to make the mistake of assuming that if common stock prices are heading up or down the same will be true of their preferred cousins. For example, the Cyprus clawback event that occurred during early 2013 pushed U.S. preferred stock prices up without pressuring common stock prices. During that event, citizen savings accounts in Cyprus banks were raided by the Cyprus government to help make sovereign debt payments. The resulting run on those banks turned income investors there into preferred stock buyers here in many cases. But during 2014, the failure of the Fed’s withdrawal from QE to produce an increase in interest rates affected preferred stock prices in the same way as common stock prices – they both went up. 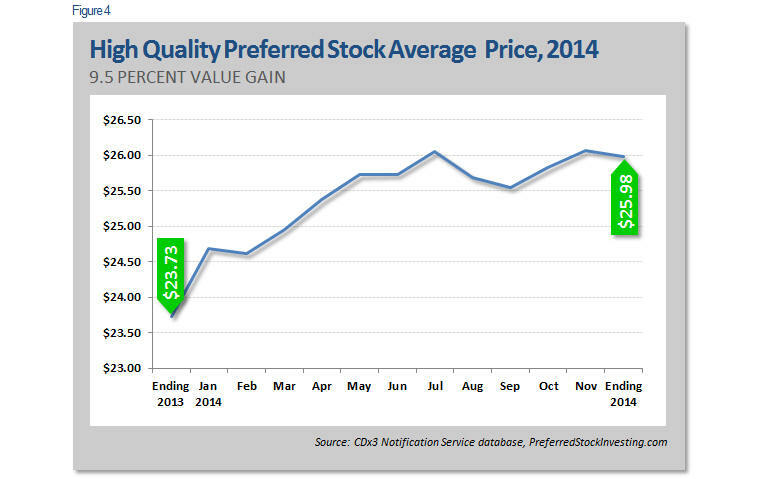 High quality preferred stocks started 2014 at an average market price of $23.73 per share. By high quality, I am referring to those issues favored by most risk-averse preferred stock investors – cumulative dividends, call-protected, investment grade ratings, etc. But as it became apparent that interest rates were not going to be increasing after all (which would have pushed prices for fixed-return securities down), income investors started buying, pushing the prices of high quality preferred stocks up. 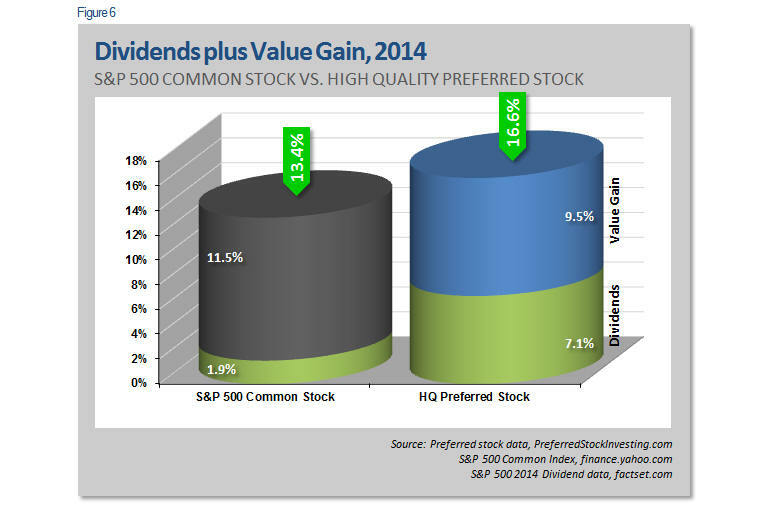 By the end of 2014, the average market price of high quality preferred stocks was $25.98 per share, a value gain of 9.5 percent. 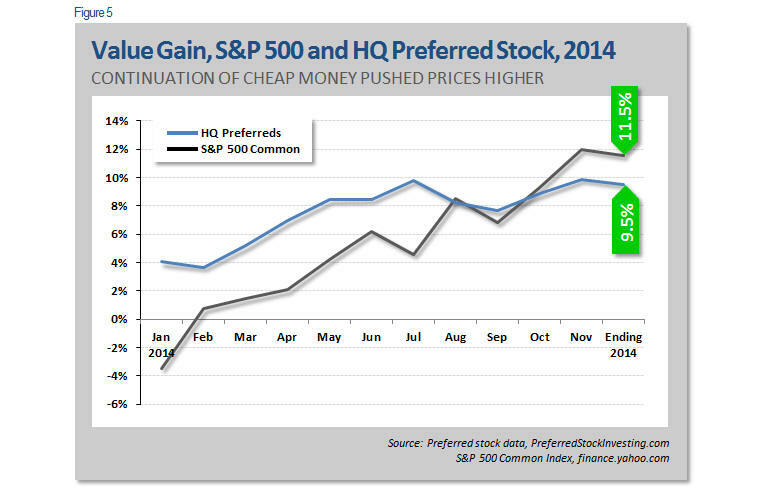 The following chart shows the percent change in market price for common stocks, as reflected by the S&P 500 Index, and high quality preferred stocks throughout 2014. While the preferred stock value gain of 9.5 percent was not as impressive as the 11.5 percent seen by common stock investors, preferred stock investors realized substantially better dividend income throughout the year. Specifically, while common stock investors saw 1.9 percent in dividend yield, preferred stock investors buying shares in January 2014 realized an average of 7.1 percent by year-end. For 2014, preferred stock investors investing in the highest quality issues saw a combined return (appreciation plus dividends) of 16.6 percent, compared to 13.4 percent for common stock investors. While outperforming common stock investors, preferred stock investors were exposed to substantially lower risk. 2014 provided a case of higher returns being realized by those taking substantially lower risk. As good as the return provided to common stock investors was, that seen by those investing in high quality preferred stock, on average, was better. 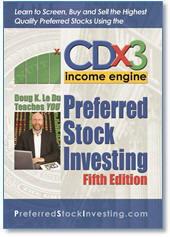 Preferred Stock Investing, Fifth Edition Now Shipping!